The Chromium browser is the open source version of Google Chrome browser and has pretty much all the features that Chrome has, excluding proprietary plugins. 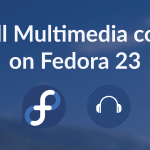 Chromium is not available in the default repositories of Fedora yet. So it has to installed from a different repository. $ su -c "wget https://repos.fedorapeople.org/repos/spot/chromium/fedora-chromium-stable.repo -O /etc/yum.repos.d/fedora-chromium-stable.repo"
Now install the chromium package with the dnf command. All necessary dependencies are also pulled in automatically. That should finish the job. Now you should be able to launch Chromium from the applications list. One thing that remains incomplete is flash support. Chromium now uses Pepper API based plugins so the old NPAPI based flash plugins from Adobe will not work. Google Chrome comes with the pepper flash plugin inbuilt, but Chromium does not include it. Pepper Flash for Fedora is available from 3rd party repositories like RussianFedora. Extract the contents of the rpm using file-roller archive manager. Now restart Chromium, and visit http://www.adobe.com/software/flash/about/ and it should show that Flash is installed and working. Or open the url chrome://plugins and you should see any entry named "Adobe Flash Player". Your flash link is broken.